Right now, reading this, what is the consciousness you are having of your screen, or the room around you? That consciousness is not physical. You cannot see it with your eyes or with any physical instrument, however subtle. You cannot touch it, you cannot sit on it, you cannot photograph it, you cannot reproduce it, you cannot measure it, etc. Try this brief experiment if you like: close your eyes and generate the wish, “How wonderful it would be if everyone was happy and had the causes of happiness!” Hold that thought. And for the purposes of this meditation, we can observe clearly that this love was not physical – it had no shape, color, size, location … It was clear awareness, a different entity to the body, and somehow both nowhere and everywhere. Another good way to get to the clarity of the mind is just to observe our thoughts for a while and then ask: “What is that thought? Where is it?” Or “What is that perception of the sound? Where is it?” We are not going to find it anywhere in the physical world, are we? We meditate on that awareness itself, which is clarity. We let that clarity dissolve into the clarity of the root mind where it came from, and come to feel that we are meditating on the root mind at the heart. If, while meditating on our root mind, we hear the sound of a car, we can ask ourselves: “Is that sound of the car inside my mind or outside my mind?” Up until now, if we find we get distracted in our meditations, it could be because of our instant assumption that it’s out there, and I either like it or don’t like it. There’s an instant narrative based on duality and separation: “I have time to go out shopping in my own car later. Which reminds me, I am out of ketchup. Oh, and darn, my Florida driving license has expired!” Or, “It’s so noisy here! How am I ever supposed to get good at meditating?” etc. Or the person next to us shuffles around and it takes us outwards instantly to the time they annoyed us earlier, and reminds us that, oh yes, this person is proving to be a cause of irritation in my life, and now would be a good time to plot a way to get rid of them. We spend most of our life caught up in these narratives. “Elaborations” is the word Buddha used. I used to do this clarity of mind meditation a lot on the beach when I lived in Florida. To begin with, I’d hear a crunch and my mind would immediately be after it, going out to the sound and creating a narrative, so, so fast. How big is that dog? Where is he? What’s he up to? Is he coming over here? I wonder what he looks like.” Sometimes I’d make myself so curious that I’d open my eyes to peep, and every time the appearance was completely different to my distracted imaginings. This was illuminating as I realized that I was doing that all the time with everything. Living in an hallucination that is appearing as if outside my mind, and as if it’s really happening; but I created it and now I’m stuck in it. I’m craving certain bits and rejecting others, and getting depressed, then excited, then depressed again. There’s a lot of inappropriate attention. But it’s a dream. And once we realize it’s a dream we’re free. We’re free to create our dream, the dream of enlightenment. In the meditation, once we feel we are in our heart, we recognize simply that we are experiencing our own mind, clarity: an inner empty space that always lacks form and is the basis for perceiving objects. We abide with it. Then when we get distracted, we ask “What is it that is aware?” Don’t run after the object, don’t go out. Let your thoughts dissolve inwards. We let the wave-like or bubble-like thoughts dissolve back into their own clarity, with no fighting. It is so relaxing, such a relief. 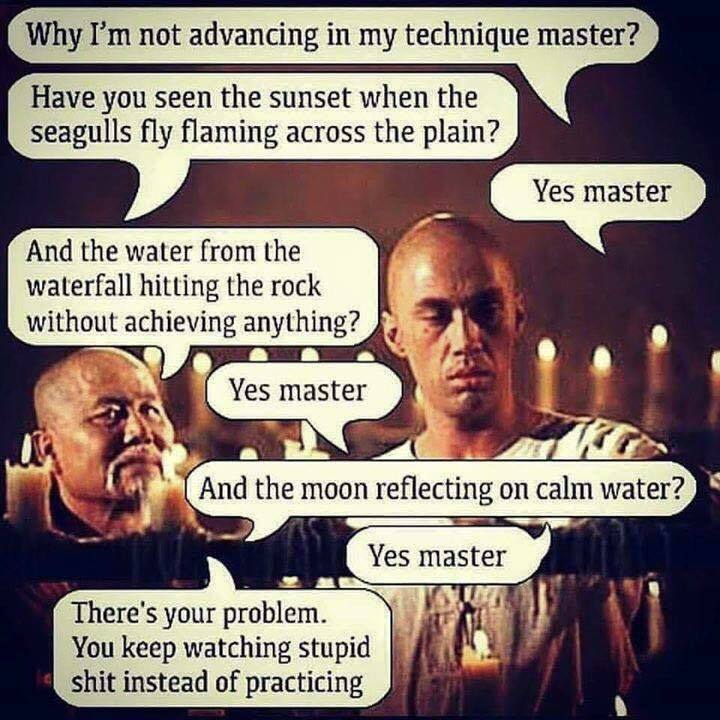 I beseech you, when doing this meditation on clarity, please do not be perfectionist. “I’ve tried this already, I know what’s coming, I’m going to fail. I am a failure. Thanks a lot!” One of the biggest obstacles to any meditation is perfectionism. This basically means grasping at results — having an idea of what we SHOULD be experiencing and then being unhappy with what we ARE experiencing. In this meditation we have to be in the moment, very present, moment by moment; and within that, stop having the idea that I should be experiencing an inner empty space devoid of thoughts and appearances, vast, peaceful, spacious, joyful etc., but instead I am experiencing a mass of confusion! It’s all grey! I can’t do this meditation! That’s like saying I should just be experiencing light but all I’m experiencing is a bunch of trees with light on them. See the point? We can use analogies both to get a feel for our mind and to stop us struggling with our distractions, eg, a crystal clear sky or a boundless ocean. Then we are not pushing thoughts out of our head but just letting them dissolve – we are not bothered after all by clouds drifting across an empty sky or water bubbling up in a blissful clear ocean. We know there is nowhere else for these to go, so we let them be, pay them no heed, and let them dissipate or pop themselves. We don’t push in this meditation — we just let thoughts go. We drop them. Pay them no attention and they naturally dissolve back. If we are not thinking them, thoughts disappear. Our mind creates everything – we come to see this in the meditation. Normally we are so busy focusing on objects rather than thoughts that we don’t realize how creative our thoughts actually are! We are so conditioned to assuming that the world we created with our thoughts has nothing to do with us — it is just there and we bump into it. Shifting our focus from the perceived to the perceiver, from the object of consciousness to consciousness itself, really gives us a feeling for how our mind is the creator of everything, including the mind itself. If we understand the power of our mind, we can see how we need to exert control over it as it can and does take us in any direction, including to immense suffering. Examples of the destructive power of uncontrolled minds, anger for example, can be seen every day, eg, in the 254 mass shootings there have been in this country just this year alone. There is crazy stuff going on all over the world, all the time. Instead of continually changing externals, we have to understand that we need to change the mind and then help everyone else do the same – otherwise, this world will remain an out of control reflection of out of control minds. That power of the mind is the most powerful force there is. The deeper we go into this meditation, the more we understand through our own experience that everything is created by the mind. Everything is the nature of the mind, which means there is nothing outside the mind. We cannot find anything outside the mind. This is why one of the benefits of this meditation is to set us up for the experience of emptiness — not just of the mind, but also in general. If you are in any doubt about the creative power of your mind, just consider what you did last night. In your dream, you created a whole world. You didn’t even realize you were doing it at the time — in fact you assumed the dream world was outside your mind and reacted accordingly. But it was always projected by your own mind. In the same way, if you were to look now, you could not find anything outside of your experience of your world, for example your own experience of sitting here reading this blog. The other day in the Denver Botanical Gardens I was looking at reflections in a lake (pictured) and asking myself: “Where is that reflection of the sky? Inside the lake or outside?” It seemed that the sky reflected was not other than the clarity of the lake reflecting it. From the lake’s perspective, the sky is already there – so there is no need to go out to it. Is the object we hanker after inside our mind or outside? And after all, who else even has exactly the same reflection in their lake-like mind, and therefore the exact same hankerings? Seeing everything as the nature of the mind is an effective way to reduce attachment (see what Geshe Kelsang says about the Chittamatrins in Joyful Path of Good Fortune.) We already have what we need inside the mind so there is no need to go chasing it somewhere else where it isn’t. We can, if we are skillful, even use our worldly pleasures to stimulate bliss, which was already and always will be inside the mind, not outside. If we think we can find the object of attachment outside the mind, we can always go looking for it, as in the meditation on emptiness, more coming later. What’s the point of rearranging the screen? This meditation helps us understand the futility of putting all our energy into externals when the world is not outside our mind. The world is a projection of our conceptual thoughts, mere imputation – putting all our efforts into changing it outside is a bit like getting up during a movie and trying to rearrange the actors on the screen. To clean up our world, we need finally to clean up the projector of our mind, change the movie reel. Of course we can still DO things – the definition of a person is to create actions and experience their effects, and our actions are mental, verbal, and physical. But what is going on in our mind is key. I had one more article on delusions up my sleeve, quickly finishing off the six causes of delusion as these are so practical. They show how delusions arise in dependence upon other factors and so, if we avoid those factors, we don’t have to experience the delusions. First it is worth remembering, as always, that it is our dualistic mind of self-grasping that is distorting our reality – reality itself is fine. We grasp at self and we grasp at other, and so we have a problem. And, believing in our own flimsy projection of our limited self, solidifying it, we grasp at negativity and impurity that are not actually there; they are the infrastructure needed to hold up this projection. “How is it even possible for me, me of all people, really to be free from all delusions?! I’m made of them!” we think. Instead of recognizing that the nature of our mind is fundamentally pure, our ego minds project impurity where it does not exist. Without the deep, abiding, confident recognition of and identification with our Buddha nature, although we may try to clean up our acts a little, we cannot help but reify our sense of an impure, unworthy self with the notions that we are deluded now, we will always be moreorless deluded even if we practice meditation, and we will probably die deluded. Luckily, these deluded projections have no power from their own side to stick because they are not the truth. They are momentary and extrinsic, like clouds in the sky – they can never become part of the pure, spacious, sky-like mind itself. Our own mind has always been naturally pure and brimming with every blissful potential for happiness and liberation, it is pure now, and it will always be pure. What we call delusions are superficial clouds arising from temporary causes and conditions that can be removed. They are fantasy. Once we start to relate on a daily basis to our Buddha nature, everything becomes easier and more joyful, and we find there is in fact no room in our space-like, empty mind for heaviness or mawkishness. Right now, although delusions have no actual leg to stand on in the space of our Buddha nature, following our delusions is the path of least resistance because it is the path we have always trodden. In certain situations, for example, we are always going to get annoyed because we always have. But if we practice patience in that situation, everything will change. On a long hike some years ago in Andalucia, I got amazingly lost in the mountains when I followed the goat trails mistaking them for some kind of human path going somewhere useful. As darkness fell, me and my companion, a dog called No No, realized that just because a path is well trodden doesn’t mean it’s the best path to take. Luckily, No No (so-called as he was a very affectionate, grubby stray and everyone in the village was always saying “No, no!” when he jumped up on them) not only stayed perfectly cheerful, but also had a better sense of direction than I, so we got home eventually. Thing is, we have to start treading new, positive paths until they become clearer and easier to follow than the old ones, which will meantime become overgrown through lack of use. We come to the point where it’s easier for us to be patient than to be angry, it’s easier for us to feel love than to feel dislike, it’s easier for us to feel spiritually energetic than to succumb to the laziness of attachment. We even eventually get to the point where we’d have to work at it to develop delusions! Not that we would work at it, but if we wanted them, we’d have to. Imagine! Definitely this will happen. We know from our own regular day-by-day experience that everything becomes easy with familiarity. When I first started to drive a car, for example, it seemed almost impossible! In fact, I was relieved, aged 17, when I failed my test because it indicated that there were no drivers like me on the road. I thought I was never going to learn all this stuff! But we do. Next thing we know, we have music playing, we’re talking to other people in our car, we’re eating crisps, (some people these days even seem to be watching TV), and we’re still driving, effortlessly! Effortlessly. In the same way, when we become familiar with positive minds, they will start to arise effortlessly regardless of what we’re doing. We won’t have to work at it. Until we get to that point, we need to work at it; but the end is in sight. In fact, there is nothing wrong at all with having love and compassion and feeling close to everybody, but this cause of delusion seems to be talking about whom we are influenced by, whom we allow ourselves to influenced by; so we can check. If we are coming under the influence of people who are leading us into more delusions, who have no interest in developing their minds, then this will rub off on us. We are a bit like sheep, aren’t we? (Or goats, judging by my example.) Let’s face it, we copy the people around us, and we especially copy the people we admire. (We do it consciously and unconsciously). We don’t much like breaking ranks. That is fine if they are doing good things, but a cause of going backwards if they are not. Geshe Kelsang talks about this cause of delusion over a couple of pages, there is a lot to it; but what I mainly take from it is that we’re easily influenced by our friends, so either choose good friends and be influenced by them, or make sure we’re not coming under the baleful influence of people doing destructive things. Watch our minds. Don’t succumb to negative peer pressure. Maintain integrity. Just because other people are, for example, engaging in some kind of gossip fest about someone, slandering people, developing angry minds, doesn’t mean we have to join in. That kind of thing. Examples given are stealing, sexual misconduct, talking meaninglessly, etc. For example, if we watch a lot of violent movies or play violent video games, thinking, ‘Kill them, kill them, kill them!’, this doesn’t seem very conducive to peaceful, loving minds. We want to check what kind of junk we’re putting in our minds, and see if we can do something about it, in terms of our lifestyle. Because we’ll always justify our lifestyle, even if it’s a bad one, with our delusions. Mmm? That was just a whistle stop tour. There’s lots more to discover in Understanding the Mind and Joyful Path of Good Fortune. Someone asked me once: “How do we know that the minds like love are not just delusions, good delusions?” Good question. Minds like love and compassion are based on reality, whereas anger and so forth are not. For example, there’s no exaggeration in the mind when you’re wishing someone else to be happy out of love or wishing to protect others from their suffering out of compassion. You have an understanding of what suffering is and a wish for them to be free from it, and there is no exaggeration or inappropriate attention there. Our peaceful, positive minds are in tune with reality and our Buddha nature. Not only do we feel positive and peaceful when we are generating these minds, but they aren’t in any way undermined by our wisdom realizing the way things are. In fact, they are increased by our wisdom, whereas our delusions all automatically diminish as our wisdom improves. Author Luna KadampaPosted on 09/15/2013 09/15/2013 Categories Problem-solving & overcoming delusionsTags Buddha nature, distraction, familiarity with delusions, limited self, nature of reality, New Kadampa Tradition, overcoming bad habits, overcoming delusions, projection, Understanding the Mind5 Comments on Delusions be gone!